It’s not often that one sees a 600 horsepower 10th generation Civic Coupe taking a 70 foot table-top jump, while rubbing fenders with some of the finest hardware and drivers found on the Rallycross circuit today. Actually, it hasn't happened-yet! 2016 marks the debut of two 2016 HPD powered, “Olsbergs MSE” built Honda Civic Red Bull Global Rally Cross cars. But that’s just the tip of the iceberg when it comes to Honda’s latest 10th generation Civic promotion. 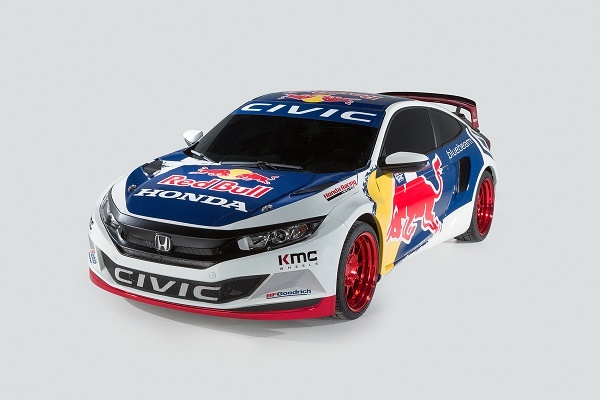 As goes Acura TLX G.T., Honda Ridgeline Baja Race Truck, and 2015 Pikes Peak NSX Pace Car, Honda hopes to extend the unprecedented buzz that is the all new Civic by participating in world-class Red Bull Global Rallycross. Civic Red Bull GRC takes on Citroen, Ford, Hyundai, Subaru and V.W. True enough, a 560 horsepower Volkswagen Bug won GRC in 2015. This year a very modified production based 2016 Civic, with two of the top drivers participating today in Global Rallycross come to the circuit -- with the backing of Honda, the brand that currently dominates the compact car market in North America through Civics' unprecedented 40% growth trajectory for 2016. Although Honda Performance Development stops short of releasing the engine and chassis specifications for its latest racing venture, we do know that the Rallycross Civic is based on the production 2016 Civic Coupe -- turbocharged -- and suspended to take 70 foot table-top jumps, while holding the line on dirt and asphalt surfaces. We’ll keep you posted when and if Honda releases the engine specification, driveline details and chassis modifications. This time Honda teams up with co sponsor Red Bull, Honda Performance Development, and Olsbergs MSC, 4 time Supercar title winners. Driving duties go to Joni Wiman and Sebastian Eriksson, two of the top drivers in Red Bull GRC.